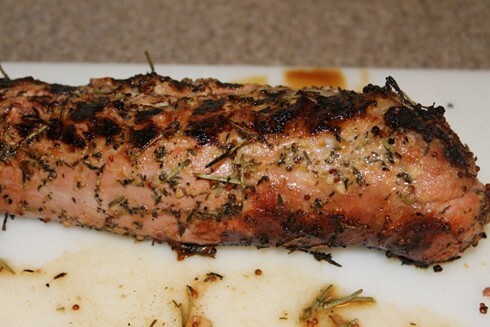 Best grilled pork tenderloin I've ever had! Quick, easy and so tasty! Serve over rice with seasonal grilled vegetables for a delicious meal. Original recipe from Paula Deen. In large resealable plastic bag combine 1st 8 ingredients and mix to combine. Add pork roast, seal and refrigerate at least 4 hours and up to 2 days (I did 1 day). Remove pork from marinade discarding marinade, and let stand at room temperature for 30 minutes. Pre-heat grill to medium-high (350-400); grill roast with lid closed 10-15 minutes per side depending on thickness or roast or until a meat themometer inserted in thickest portion registers 145. Let roast stand 10 minutes before slicing. Garnish with lemon wedges, fresh thyme and rosemary if desired!